Disculpas esta página no ha sido traducido al español. The PB Special 16” spool bending machine is designed to bend 1,5D and larger pipe spools using induction heating and manipulate pipes in between bends in an automated way. The machine settings can easily be determined with the help of the Cojafex Estimating Package. This package can also be used to estimate the expected bending times and cost price for the bending operation. 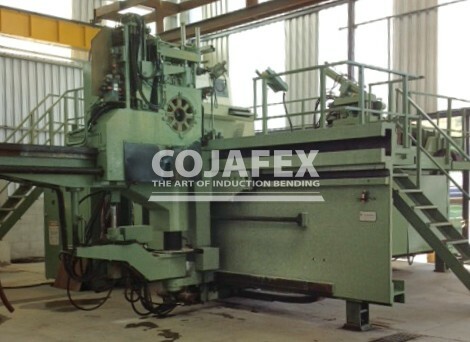 The machine can either be programmed with the help of the user friendly Cojafex Operator Interface or by uploading jobs from the Cojafex Estimating Package After programming, the bending process will proceed in a highly automated fashion. This machine will be refurbished and upgraded to the latest COJAFEX standards.